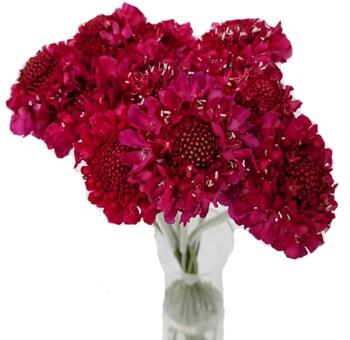 Scabiosa can be used in a number of ways, including accentuating bridal bouquets and wedding centerpieces. They are also known as pincushion flowers because they work perfectly as focal or filler. They lend a fresh garden feeling and special events. They are offered in both blue and white shades and are especially popular as summer wedding flowers. 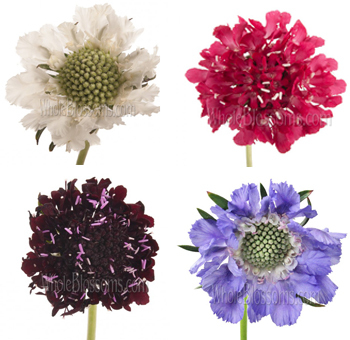 You can choose from both Scabiosa pod and traditional varieties. They are available at discount prices online and are highly recommended for bouquets and wedding accents. As always, they are fresh cut and shipped directly to you for the longest available vase-life. 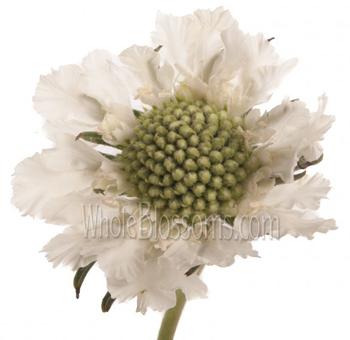 The wildly popular Scabiosa is increasingly used in a lot of floral arrangements these days. Surely enough you've seen the small petalled gorgeous flowers. They have a small bloom on the inside and the middle of the flower that has pin-like styles emerging out of the bloom giving a wonderfully whimsical appearance. Some of the most magical looking colors they are available in are blues, whites and Lavenders. 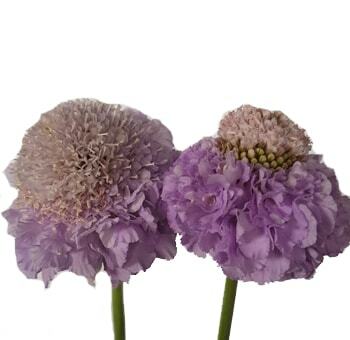 Lavender Scabiosa flowers are generally pale and a perfect addition to wedding décor and bridal bouquets. The Scabious which is known as the scabiosa, the vivid violet, butterfly blue, or even pincushions produces what can be described as large blooms with styles emerging outwards giving an appearance of pins and needles poking out of a cushion. They are generally in shades and hues of blue, rather large and a favorite garden flower too. It produces tons of nectar attracting a number of bees and butterflies as a result. The Scabiosa has a long stem with a flower out of which pin as florets emerge inside a bloom that is half an inch in diameter. Their thin knife line leaves are usually of a grey and green color with roots that can go approximately eight inches underground. They are found extensively in Europe as well as Asia and have been grown since the eighteen hundred when they were first bought here from Hungary and Russia. The plant is mainly available between July and September being the time it blooms and is at its prettiest one can create new scabious plants by dividing the existing plant in early spring or summer. It should be planted where it can receive the most sunlight. The best time to sow would be after the last frost of winter. Many perennial scabiouses can also be sown in spring or summer. 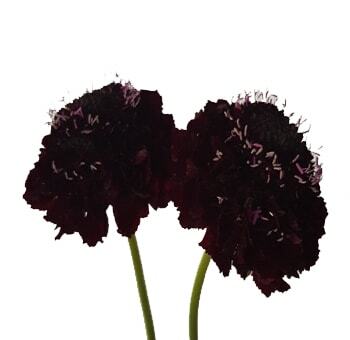 This plant prefers a natural soil which is drained well and is more dry than damp. Sandy or Clay loams are the best soil for them to thrive in or any neutral to alkaline soil may work. 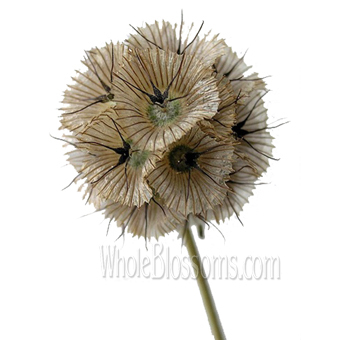 The Scabiosa flower comes from the genus of teasel family, flowers and shrub. You can identify them through their leaves and stems that are prickly and also their purple and blue flowers. They are extensively native to climates that are temperate and are found all over Asia, Europe, and North Africa. Just one field of Scabious plant produces more than two thousand seed which can be in the soil for quite a long time. Blue Scabiosa’s are especially popular as cut flowers and coming second would be the violet and lavender shades of the Scabiosa flower. They are increasingly being used in floral arrangements, and they give out a different texture and an intriguing and exciting finish to bouquets and centerpieces. Your perfect bet at finding these beauties at their best would be from wholesalers. Going around town florist to florist is not an exciting option. That's why all you need to do is place an order online and wait in the comfort of your home for your blooms. 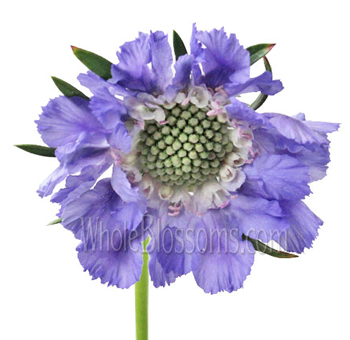 We suggest you to buy blue scabiosa and scabiosa pods from vendors like Whole Blossoms. They guarantee not only a fresh flowers delivery but also a 24/7-hour delivery system which is honestly a relief. They are a trusted cut flower wholesaler who can cater to all your flower needs.